Coir Fiber is one of the versatile products of the Coconut palm (Cocos Nucifera L.), known as the Tree of Life. The palm also known as coconut tree is truly a source of renewable raw materials for both Food and Non-Food products. This makes the coconut tree and the coconuts unique. 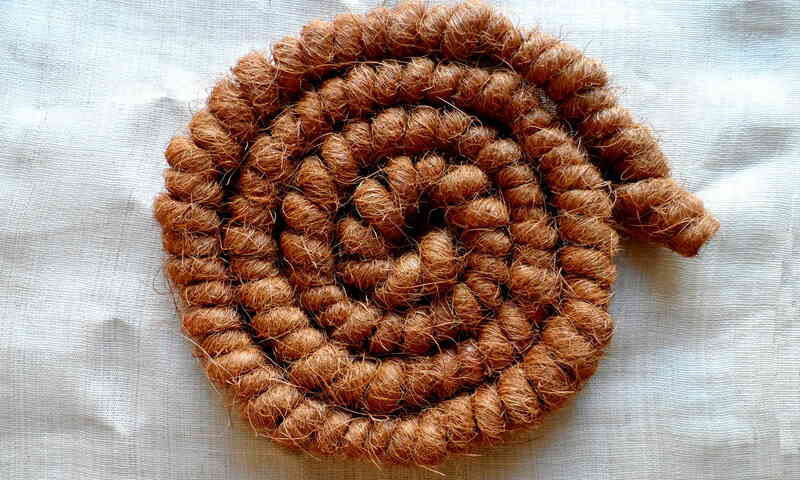 Coir fiber is a lignocellulosic fiber extracted from the coconut husk. The fiber can be extracted from either Green Coconut Husks or Mature Brown Coconut Husks. Both raw materials result in fiber types with slightly different characteristics. Coir fiber has the highest concentrations of lignin, a natural polymer. therefore most suitable for applications such as geotextiles, where slow biodegradability is required. Coir fiber is used in a wide range of applications such as floor coverings/carpets, door mats, furniture padding and as filling for mattresses. Traditionally also in brushes, ropes and twines. Due to its resilience and high elongation properties coir fiber and natural latex are combined, as biobased composite, to be used in automobile seat production. None woven rubberized coir sheets are used as insulation and as packaging material. The coconut tree grows in many countries of the world. But the coir fiber industry is only fully developed in a few countries. It is estimated that only about 30% of the totally available coconut husks is processed to obtain coir fiber. Coir fiber production provides work and income to several thousands of rural, often poor, families in the major producing countries like India and Sri Lanka. Coir is also produced in other countries like Philippines, Indonesia, Vietnam and Brazil. Coir fiber production typically takes place in micro and small family businesses. The fibers can be extracted by various methods, starting with retting in water, typically between 21 – 60 days or wetting / soaking in water from 1-3 days. After the husks are naturally softened in water, the fibers are extracted by hand-beating, decortication or de-fibering mechanisms. The fiber is then further cleaned by sieving before being used in further process steps, like yarn making or other production methods. The world coir fiber production in 2016 was 1.214.120 tonnes. Coir fiber is now the the top 3 of natural plant fibers in terms of volume. The production is mainly in India and Sri Lanka. Other exporters of coir are Thailand, Vietnam, the Philippines and Indonesia. Most of the coir fiber produced is exported in the form of raw fiber. Smaller quantities are exported as yarn, and as mats and matting. Coir pith, a secondary product of coconut husk milling, is increasingly gaining economic importance as a horticultural medium.